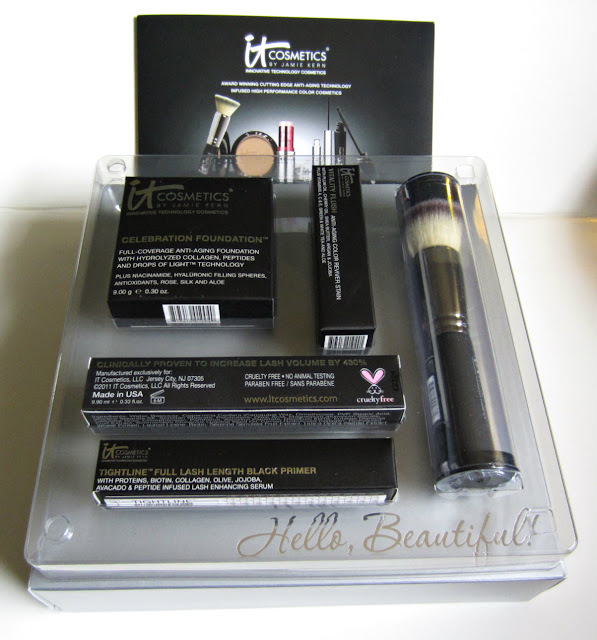 IT Cosmetics Hello Beautiful Kit is QVC's TSV March 18! QVC will be offering the IT Cosmetics Hello Beautiful 5-Piece Anti-Aging Color Collection Kit as their Today's Special Value (TSV) tomorrow, March 18. I recently received this kit to review, and I think it's a great package of products, particularly with a price of only $54.96 (also available on Easy Pay for 3 payments). I've been hearing a lot of good things about this brand, and after using the products for a couple of days, I can see why! With the Heavenly Luxe Buffing Airbrush Foundation Brush, swirl circles in Celebration Foundation to grab product. Buff into skin in circular motions. 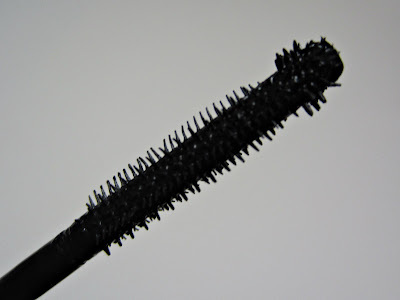 Starting at the root of your lashes hold the Tightline Full Lash Length Black Primer Skinny Wand horizontally then wiggle and sweep through to the tips. For a more visible eyeliner effect, gently press the Tightline wand along the base of your lash line, filling in the gaps between your lashes. Move along the entire upper lash line for a beautiful eyeliner effect. Starting at the base of your lashes, hold the Hello Lashes brush horizontally, then wiggle and sweep the brush up and through to the tips. Next, hold the brush vertically and push up your lashes. Finally, use the lash ball detailer to add definition and separation to your lower, inner, and outer corner lashes. Apply Vitality Flush 4-in-1 Reviver Lip & Cheek Stain Stick to lips, cheeks, and any area you desire a beautiful sheer wash of vitality-filled color. To give your cheeks a pop of youthful color, gently pat and blend into the apples of your cheeks. The kit comes boxed, with the products packaged in a snapping plastic tray. There's also a descriptive brochure that explains the proper use of each product. 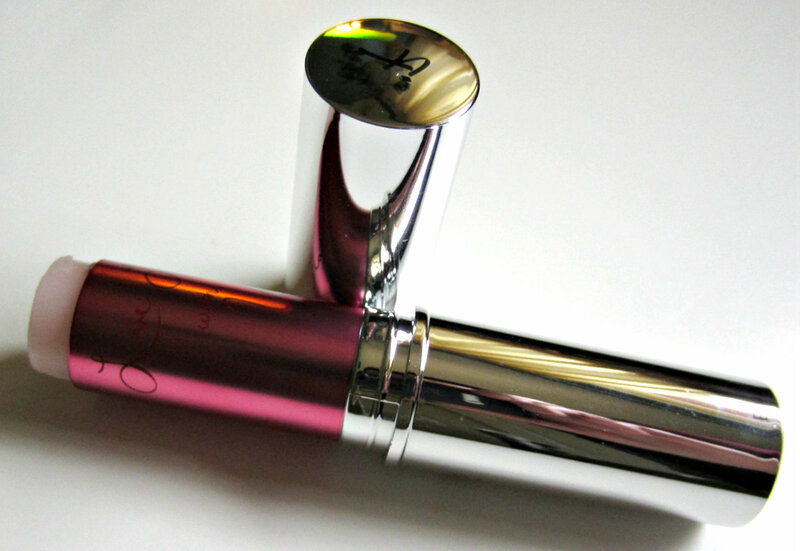 The Vitality Flush 4-in-1 Reviver Lip and Cheek Stain Stick in Je Ne Sais Quoi was love at first swipe for me. This rates high on the fun factor list for me, because it changes color right before your eyes. But it's more than fun, because it also gives a beautiful flush of color to my cheeks and lips. It comes packaged in a metal twist up tube, and the product itself has a soft balm-like texture. I use this on my lips for that "just bitten" flush, and on my cheeks over the Celebration Foundation. I then set it with a very light touch of the foundation. It adds a bit of sheen to my cheeks, and the light dusting of foundation alleviates the feel of the balm, but still allows the color and the slight sheen to show through. 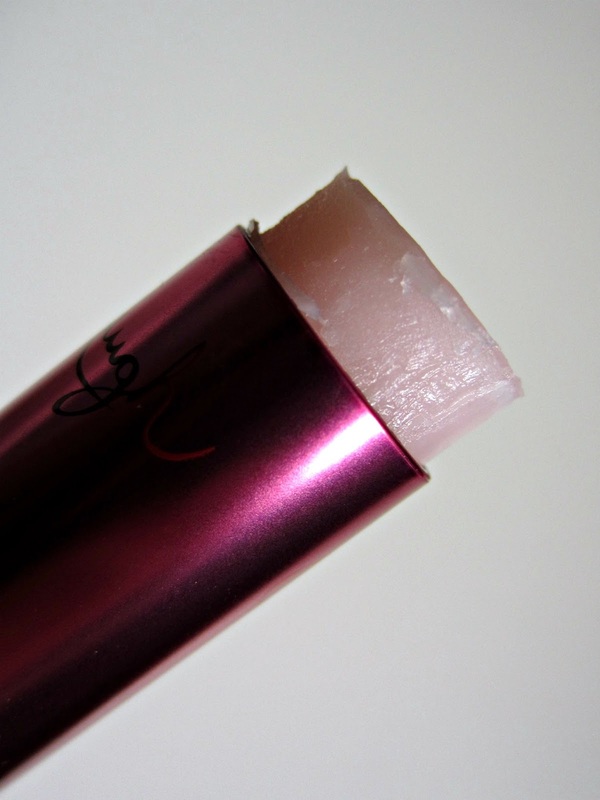 It's like a tint or a light stain--very natural looking, and it feels nourishing on my face and my lips. The Heavenly Luxe Buffing Airbrush Foundation Brush is a top quality tool. It's very soft and plush, but with more than 80,000 hairs, it's also very dense, allowing it to pick up an even amount of product. 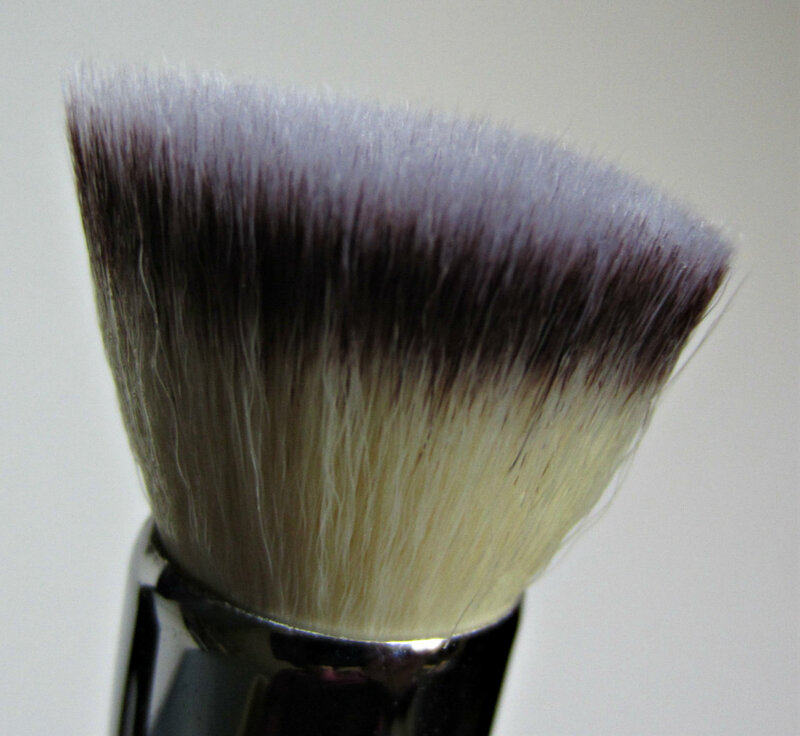 Using circular motions, I apply the Celebration Foundation with this brush, and the results are a smooth, even finish that looks about as flawless as I've even seen on my face. The combination of the foundation with the brush works so well, that I've been able to eliminate my need for concealer. The Celebration Foundation is available in 5 shades: Fair, Light, Medium, Tan, and Rich. I received the Tan shade, and even though I would call myself Medium this time of year, it actually looks perfect on my skin. 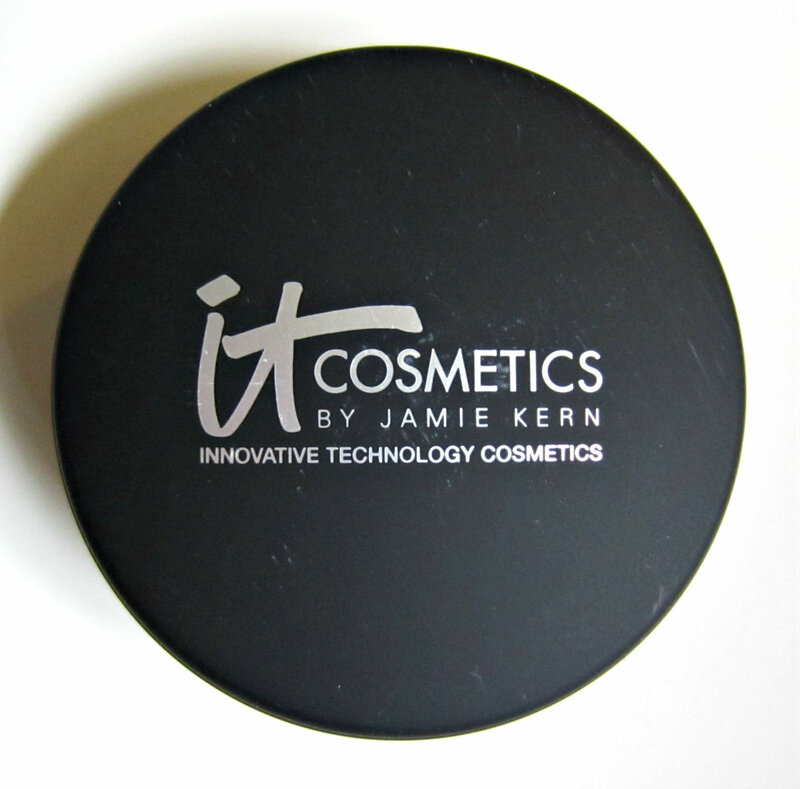 This is a full coverage, hydrating powder foundation that contains plenty of beneficial ingredients to enhance your skin. Those ingredients include Peptides, Hydrolyzed Collagen, Silk, Anti-oxidants, Grapeseed, Olive, Hyaluronic Acid, Rose, Aloe, Niacin and Vitamins A, C, E. I've mentioned before that I love products with Hyaluronic Acid, so I was thrilled to see yet another product that has included this in the ingredients. My normal powder foundation in Lancome Dual Finish in Matte Amande III, and the Celebration Foundation reminds me of that finish-wise. It's more full coverage than the Lancome, so I don't need to build it up as I do with the Lancome. 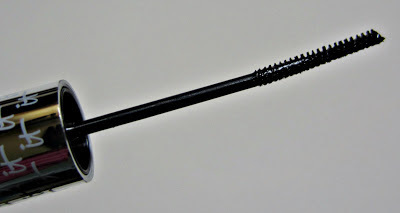 Hello Lashes 5-in-One Mascara "is clinically proven to quadruple the volume of your lashes using a proprietary blend of lash-enhancing and conditioning ingredients." Of course I didn't read the directions initially, and my first thought was that this was a nice mascara--it added length and volume, and there was zero clumping, but I wasn't "wowed" by quad sized measures. Then I thought after the fact, that maybe I should read what they had to say about their product! In bold letters, the directions said to go vertical after going horizontal, and to do this using the ball at the end of the wand. That does make a difference, and a noticeable one at that! 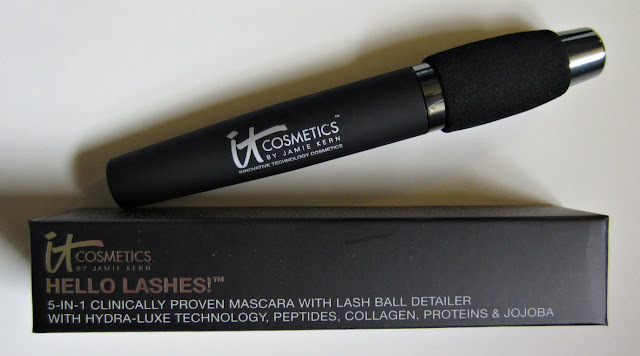 I often skip my lower lashes because the wand seems to make more of a mess, but the tiny bristles at the very end of the ball makes it a breeze, so that's another nice thing I like about this mascara. The Tightline Full Lash Length Black Mascara Primer is noticeably different from all of my other lash primers because it's black. I always have to be very careful to coat my lashes well with mascara when using other primers, since they are all white. This is glossy and black, and you could get away with just using this and no mascara for a natural look. The brush on this is extremely thin, but it's able to define and coat your lashes from root to tip without a problem. To add a tightline effect, the brush can be gently pressed along the base of your lash line to fill in the gaps between your lashes. I wasn't so sure this would work as well as tightlining with the various eyeliners I use for such a look normally, but I was pleasantly surprised by how well it did work. This saves me some time too, so it's all good! I'm very happy with all of the products included in the kit, which is valued at $155.00. Be sure to check it out on QVC tomorrow at the special price of only $54.96. If you'd like to learn more about IT Cosmetics and see some of their other products in action, there will be 3 one hour shows tomorrow on QVC feauring the brand. Those shows will air at 12:00 AM, 10:00 AM, and 6:00 PM. 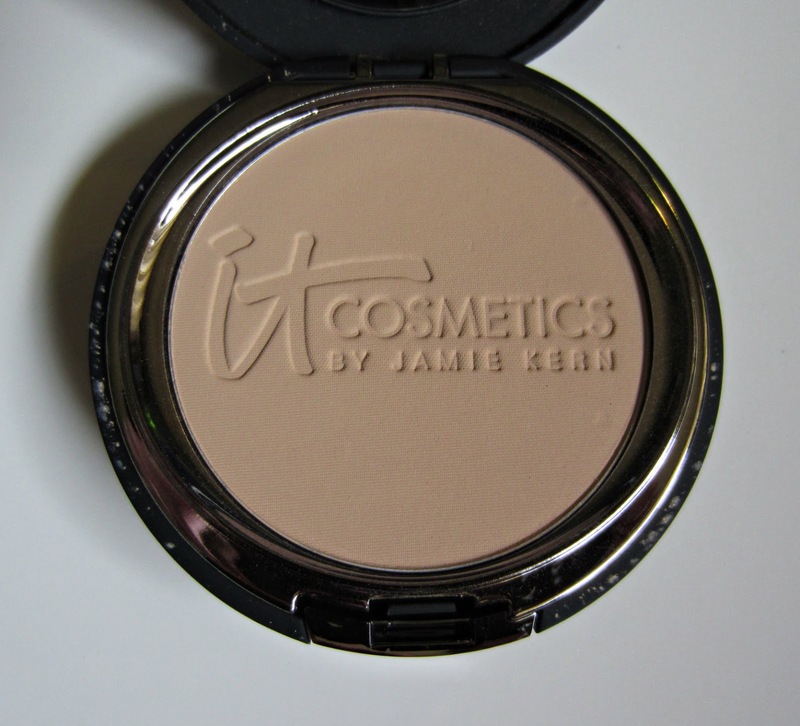 You can also find IT Cosmetics on their website, and stay up to date with them on Twitter and Facebook. I always have issues using tiny brushes. Or super fat brushes. lol Where you able to make your lashes like the ones in the photo for tightline?